In-town house with panoramic views and one-level living. Black Swan is a well-maintained, in-town home with panoramic views of Stonington’s thoroughfare. Enjoy the changing scenery of the working waterfront throughout the day, as lobster boats, sailboats, schooners and other vessels work the waterways. Black Swan is a ranch style home with all the living areas on one easy-to-maneuver level. The home is bright and airy with a full wall of windows looking toward the sights of the harbor. Black Swan has three bedrooms and two bathrooms. The home has a open plan with a large and well-equipped kitchen, a living room area and a formal dining section. The living room is comfortably furnished with a sofa and two chairs. There is no television at Black Swan but the homeowner provide a high speed internet connection which makes streaming and browsing easy. The dining area has seating for six and enjoys large views of the harbor. The home has a lovely fireplace that is just decorative and is not available for use. Black Swan’s first bedroom has a twin bed, a closet and a dresser. The second bedroom has two twin beds, a closet and a dresser. The third bedroom is a master suite with a king bed and a private bathroom. Black Swan has a large ocean view deck, a laundry room with a washer and dryer in place. There is a paved driveway where the charcoal grill is set up and a garage bay available to the tenant. Black Swan is a spacious home in a great village setting, perfect for your Maine vacation. Outstanding location and views of the harbor. 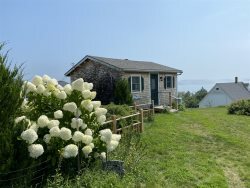 Walking distance to Stonington. Photos didnt do it justice. Fully equipped and very, very clean. Highly recommend. Would definitely stay there again.